Protein is a vital part of any fitness regimen and if you’re in the business of making any serious muscle gains, it may be impractical to get the amount of protein you need just from your diet. Protein shakes are a staple among avid gym goers and body builders because of the high amount of protein that can be consumed from a single glass or cup. However, many individuals, particularly beginners, can’t really stomach the taste of a protein shake but that’s usually because they follow the instructions on the protein powder packaging without adding any tweaks or customizations to their drink. What then happens is that drinking the shake becomes a chore and they slowing start drinking less and less, thereby halting or limiting potential gains. Adding some flavor to your protein shake, and mixing it up from time to time is the key to your long term success. This article touches on a few simple but impactful ways to make your protein shakes much more palatable. 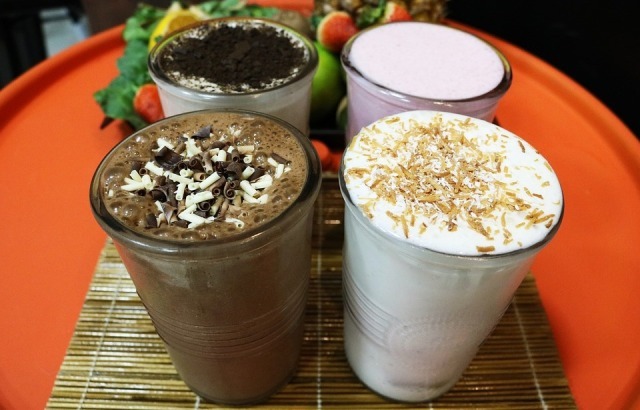 Protein shakes are often mixed with water as it's considered the healthiest option. Mixing protein shakes with milk, though, also has benefits. Not only will the shake taste better, but you'll receive a boost of protein which can also help your muscles recover more quickly. If you're looking for a tastier protein shake but don't want to increase your caloric intake, coconut water (or even flavored coconut water) might be an option to consider. Coconut water has a plethora of benefits, including replenishing electrolytes such as potassium, reducing cholesterol and overall added protection for your immune system. Sometimes, taste is all about the type of powder you use. Some brands have different flavors to choose from, such as chocolate, vanilla, strawberry, and even cookies and cream, but the brands themselves also add their own unique twists that can impact taste. Switching up the type of protein powder you use can lead to a tastier protein shake. You should experiment with different protein powders to find the right brand or line that makes your taste buds flutter. Two lesser known taste building options for protein shakes are ginger and peanut butter. Ginger adds spice and sweetness to shakes but the taste can be rather explosive in large quantities. A small, dime sized portion is really all you need to get that intriguing flavor without being overwhelmed. Peanut butter will thicken your shake some, giving it more of a nutty taste and feel. Ginger can also help to ease the pain from your workout, while peanut butter adds extra protein. In any case, adding these two ingredients, either by themselves or together, will certainly give your tastebuds a new sensation that will make your protein shake a delicacy instead of a chore. What’s better than a nice, cold drink after a workout? Nothing. Well, nitpickers may argue that room temperature or warm drinks are better for digestion but while that may be true, the benefits are minimal and there’s no doubt that a cold drink taste better to most of us - especially after working out. We can’t have it all, however, so the best middle ground is having your shake at a nice, chilled temperature (somewhere between room temperature and cold). I hope you enjoyed this article about top tips for a tastier protein shake so your improved nutrition can boost your performance. Interested in reading more free fat burning fitness recipes?